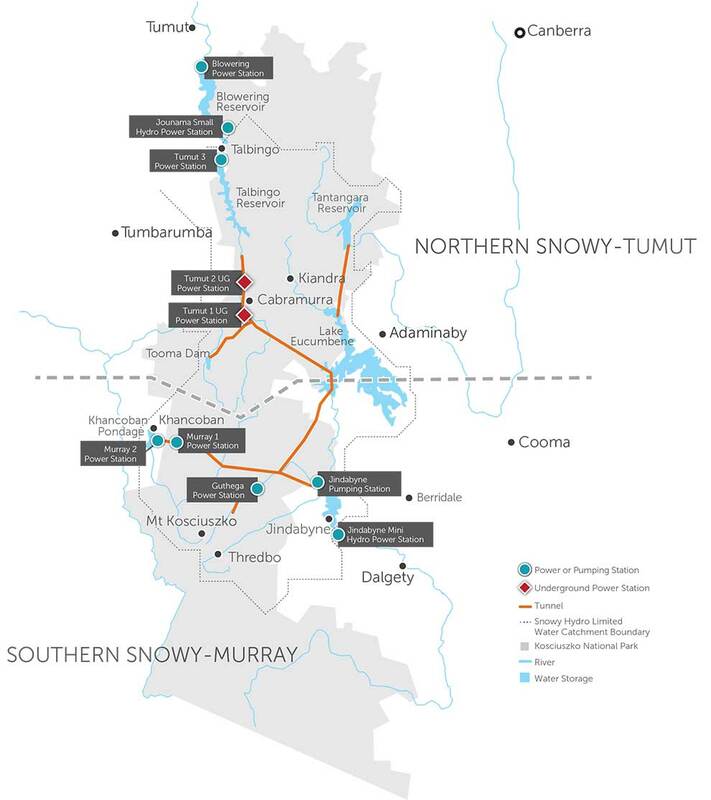 The Snowy Mountains Scheme is an integrated water and hydro-electric power utility located in Australia’s Southern Alps which is operated and maintained by Snowy Hydro. The Scheme diverts the headwaters of the Snowy, Eucumbene and Murrumbidgee Rivers westward through the Great Dividing Range, releasing water into the Murray and Murrumbidgee Rivers. This long-term water regulation is designed to counteract the effects of severe drought sequences and raise productivity in the Murray Darling Basin. In addition, water from the Scheme underwrites the production of around $3 billion worth of agricultural products every year. The Scheme was designed to collect and store water, including water that would otherwise flow east down the Snowy River to the coast, divert it through trans-mountain tunnels and power stations and then release it west of the Snowy Mountains into the catchments of the River Murray and the Murrumbidgee River. There it can be used for town water supply, irrigation and environmental use. While the diversion of water for irrigation was always the original vision of the Scheme, the engineers were well aware of the potential for the generation of hydro-electricity. The Government was able pay for the massive undertaking through the sale of that hydro-electricity, making the Scheme a reality. By directing the water through a series of power stations as it plunges 800 metres down the western escarpment, the Scheme can generate large amounts of peak-load electricity to meet the daily fluctuating demands for power in eastern Australia. Snowy Hydro currently provides around 32% of all renewable energy that is available to the eastern mainland grid of Australia and today, this clean, efficient and renewable energy continues to help light up the morning and evening rush hours of Sydney, Melbourne, Canberra, Brisbane and Adelaide through the National Electricity Grid that runs from Rockhampton in Queensland, right around the east coast to Adelaide and Tasmania. But that is not all the Scheme provides. Snowy Hydro operates these amazing assets in new and innovative ways to generate the income required to operate and maintain the Scheme well into the future.